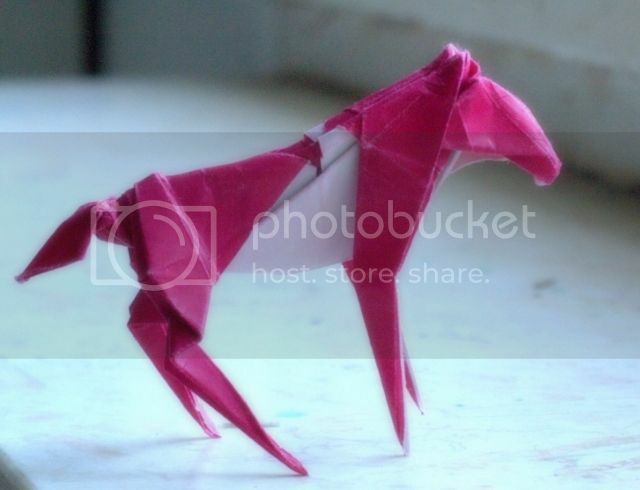 The Origami Forum • View topic - Old Kentucky Horse - McLain, Raymond K.
Old Kentucky Horse - McLain, Raymond K.
I have the 4 origami books of Robert Harbin and I'm having problems with this fold (from the 2nd book, p. 151) during a middle stage where the paper is supposed to be flattened. The model is 3-d at this stage and I'm not sure how the two legs are supposed to be moved. Re: Old Kentucky Horse - McLain, Raymond K.
May I make a suggestion as detailed in the following images? I Eventually solved this at the time but when I tried it again now the reminder helped. I don't know how to insert a picture, so a link instead. 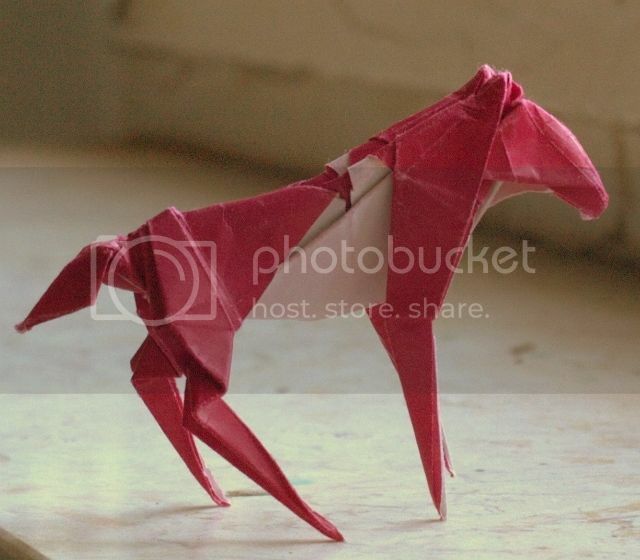 I am using paper folding in floral art arrangements, here is the Old Kentucky Horse from the second Harpin Robert book, "More Origami, The Art of Paper Folding No2.- 1971". I wonder if anyone has some other horse links. I thought the folds in the drawings differed to the nice result on the front of the book, but after folding six horses, the diagrams are correct.